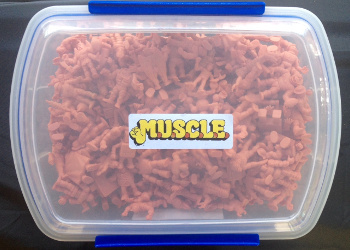 I believe the first thing any new or returning M.U.S.C.L.E. collector to the hobby does is decide they want to collect a Flesh set of figures. Why? I think there are a number of reasons. It’s attainable. Only one figure is considered uncommon and to be honest it pops up often enough. It’s cost effective. A complete set can be built for as little as $85 in my opinion. That’s at $0.25 per figure and $30 for Satan Cross. 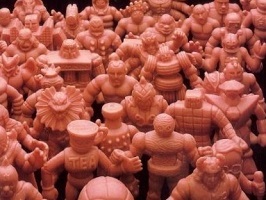 Flesh figures were the first wave of M.U.S.C.L.E. released and that means the memories are with them first. Of course there are those that sell complete sets for $300 and sometimes get it. I don’t understand the whole purchase-an-instant-collection/set-thing. Isn’t the fun in collecting and chasing figures? I know I built my set this way and upgraded figures as I bought small lots. I now have a set in which every figure is completely as mint as I can get and I had fun doing it. It’s been so long now I don’t remember the final figure I obtained to complete the set and that’s a shame. I would have loved to remembered which figure completed my set. The wonderful thing is if you asked 100 collectors what their final figure was, it’s likely you’ll get 100 different answers. Maybe Satan Cross being the exception. If I had to choose only one of the reasons, then I fall into the third category. Flesh were the first in my market and though I actually prefer the colored figures it would be stupid for me not to complete a Flesh set. Most people can relate to not knowing, as a child, how many figures were in a set (unless you were lucky enough to have a poster) and therefore there is a thrill when you find a figure in Flesh you didn’t own as a child. I know I did! I keep my Flesh set in this container and not out on display like a lot of my figures. I have one very strong reason for that. 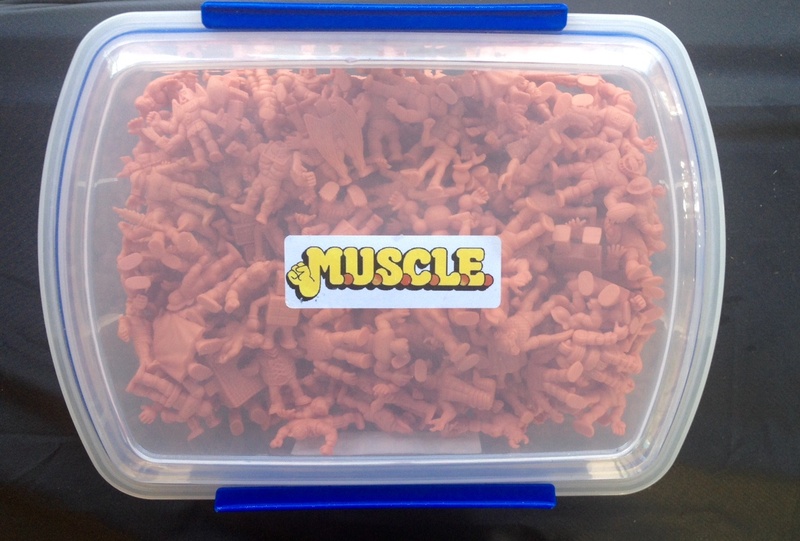 I love going to this container now and again and just opening it so I can get that M.U.S.C.L.E. smell. The longer I leave it the better the smell is. It’s much, much better than a new car smell. The fact that they still have that smell after 30 years is amazing. I like to think that because my set is practically mint that the smell is stronger/better. To this day I still have spare Flesh figures around in case I can help that person find their last figure. I have provided that last figure for two collections I know of and happy to send the last figure anyone needs for free (if I have it, of course). Just don’t ask me for a #134 as all the Flesh ones I have get painted into NFL teams! In saying that, I have seen some wonderful displays for Flesh sets. The one that stands out to me is this custom made cabinet by LRG member Vette88 (since changed his name I think) that I saw on this link. Please write in the comments what you do with your Flesh sets. This entry was posted on Monday, February 22nd, 2016 and is filed under UofM News. You can follow any responses to this entry through RSS 2.0. You can skip to the end and leave a response. Pinging is currently not allowed. Great write-up and photos. However, do you really think it’s possible to get all 236 figures for $85 these days? I don’t even think it’s a matter of patience, I just don’t think it’s possible. I have my set in a display cabinet. They take up about four shelves in the cabinet. I like them this way because they’re lined up like an army and I’ve always liked that look. That MUSCLE smell is SUCH a powerful nostalgia trigger for me! It makes me so sad when I buy a bunch of figs and they smell like smoke… or Fabreeze (I assume because they were trying to cover up the smoke). I would love to know what Bill Raeth used for his display case, it’s simply amazing. I think it is possible, but it wouldn’t be easy. I think $0.50 per figure is a more realistic estimate. So 233 figures for $116.50, plus Satan Cross and the Ring Figures. Plasticfriend, the type of wood used is mahogany, and pine was also available. The number for the person who did my case is some where in my collection thread in LRG (Walker13.1). If LRG still has the thread For New M.U.S.C.L.E. Collectors pinned under the main page of M.U.S.C.L.E., click on that, then go to the bottom of my initial post, and you’ll see a link for my collection. Some where in there should be the number. Each square is 2in in depth, height, and length. My flesh set was less than $80. It took me awhile to complete my set because I focus on trades only. Also my last final figure was #70. It took me some time to get a hold of and was trying hard not to buy it even when I saw a few #70s cheaper than dirt. But luck came across in LRG. Good times!